No eggs in the fridge; grab a banana and peanut butter. That was the theme of today. Make something quick, protein packed and full of vitamins. Okay, well it has potassium. . . and chocolate. Chocolate for breakfast, I can’t say no. It was also only four ingredients, and no cooking required at all. It also particularly works well for on the go eating when heading to the gym. Microwave flour tortilla for 20 seconds to soften it. 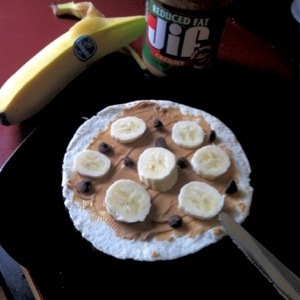 Spread peanut butter onto tortilla, top with sliced banana, sprinkle with chocolate chips, and roll. Eat and enjoy.